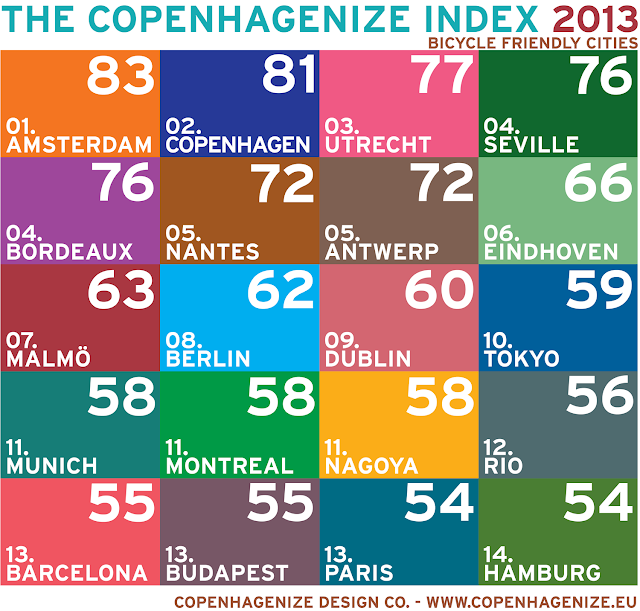 We released our Copenhagenize Index 2013 - Bicycle-Friendly Cities today. We did a countdown on Twitter and then published the full list afterwards. Business Insider published the results simultaneously, as well. The 2013 Index has taken a lot longer than we expected. We ranked 80 cities in 2011 and increased that to 150 this time round. Although this time round we had the help of over 400 individuals on every continent - our eyes and ears on the ground - to assist with the ranking. Have a look at the Index. Lots of changes in the Top 20 what with the addition of 80 new cities. We've had a lot of interest in the Index since 2011 and the way we calculate the ranking. We used it in a large report we did - together with our partners Civitas - for the Norwegian Ministry of Transport wherein we explored why Norwegian cities are less bicycle-friendly than their Swedish and Danish counterparts. All in all, it has been worth the time and effort and we thank the over 400 people who helped us out and I thank the whole Copenhagenize Design Co. team - especially Meredith Glaser in Amsterdam - for making this happen.